Listen to "When Humans Nearly Vanished" on your iOS and Android device. Some 73,000 years ago, the Mount Toba supervolcano in todayÄôs Indonesia erupted, releasing the energy of a million tons of explosives. So much ash and debris was injected into the stratosphere that it partially blocked the sunÄôs radiation and caused global temperatures to drop for a decade. 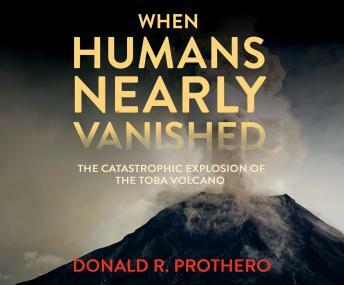 In this book, Donald R. Prothero presents the controversial argument that the Toba catastrophe nearly wiped out the human race, leaving only about a thousand to ten thousand breeding pairs of humans worldwide. Human genes today show evidence of a Äúgenetic bottleneck,Äù an effect seen when a population of organisms becomes so small that their genetic diversity is greatly reduced. This group of survivors could be the ancestors of all humans alive today. Prothero explores the geological and biological evidence supporting the Toba bottleneck theory, revealing how the explosion itself was discovered and offering insight into how the world changed afterward and what might happen if such an eruption occurred today.